RSS+Playlist+Magazine. A brilliant experiment or a desperate move? Time magazine is going to experiment with targeted marketing using a customizable magazine. Lexus is the only advertiser of ‘Mine’ so far. Magazine will be delivered in PDF instead paper. Taking video requires users to hold the camera stably for longer than still cameras. From that requirement we have video cameras that look and operate differently from still cameras. 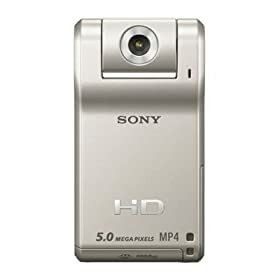 The ability to capture video has been available in consumer camera for a long time. That capability has begun to appear in pro-sumer DLR digital cameras in 2008. Is the form of cameras due for a reset? What will be the optimal video+still camera form? In most consumer’s mind, cell phones sits somewhere between being an accessory and a necessity. In the difficult times that we are in now, most of us are more conscientious about our money and therefore less inclined to flush our money for the latest and greatest mobile technological marvel. That’s why the latest trend of hardware-as-service model of mobile phone designs make so much sense. Good applications and services stretch the time-span of mobile phones. We’ve seen this in the PC market for decades (Can you imagine how fast PC market would have been it software is baked into our laptops?). If anything, the current economic hardship will only drive us faster to service-model software architectures and business models. Radio Shack in US just announced that they will carry AT&T-subsized netbook computers for $99. Sounds like a new offering but in fact is already been done by Orange in UK. Large screens of portable computers are butting up to with small screens of mobile phones, what will entail for UI and UX designers? Music lovers returning to the physical, Touch&Feel gains on Point&Click. Digital information is free, everywhere, infinitely producible but also context-deprived. Peripheral elements of contents consumption, like the feel of a book cover and the cracking sound of opening a new book, add richness to the experience. It also sets the stage in the the user’s mind for the act of reading help the user justify all the preparation that s/he may need to do (e.g. moving to a spot with good lighting or finding a comfortable chair). Most interface designs these days still focus on the contents. When usability and deliver mechanisms are figured out, I predict that end-users will start looking for context-building elements again. Recently a colleague challenged the notion of locus of attention. He insists that the singularity of our attention is bounded by each of our sense, but not the overall consciousness. In the other words, a user can comfortably pay attention to information in the audio and visual channels at the same time. Update (07/30/2007): I browsed through the chapter about locus of attention in ‘The Humane Interface’ and just as I thought, it contradicts my colleague’s claim. To make sure that information in the book has not passed it times, I posted the question to an online forum. Two designers and one lecturer in cognitive psychology also disagrees with my colleague’s claim. Human can perform trained task with another task and split the attention between them. That mechanism allows people to drive and carry a conversation at the same time. Splitting attention is an entirely different thing as having multiple attention. Within Steelcase, importance placed on design and sustainability is high, but literacy on those topics remains low. There is an imbalance between thinking and doing amongst the act of design within Steelcase, where doing is often over-emphasized. To address this issue, he created a critical thinking framework for his executives (see his slide for details). Jim believes the act of design thinking should also be expanded, beyond the narrow field that is pertinent to the subject matter, but to other related fields as well. In the library that Steelcase custom-built for Bill Gates, Jim told us that he could not find books about business or software development, but books about great thinkers in history. Jim even went as far as asking leaders in one of the business units of Steelcase to not think of themselves as furniture manufacturers, but health care equipment providers. Since its establishment in 1984, SK Telecom has enjoyed phenomenal success as a mobile carrier. But unlike most utility companies that thrive to find a comfortable niche and then do everything to maintain stability within that niche, Bumshik looks to expand SK Telecom through a new model that he called ‘Human-centered Innovation’. Instead of treating SK Telecom as an utility company, Bumshik and his executive team is implementation a vision in which the company is a Lifestyle enabling company. Innovation will be driven from improving the well-being of their customers. Their initiatives have created changes in management structure as well as processes. Following up to his Business Week article ‘Designing in Hostile Territory’, Roger addressed the frequent conflicts between business and design/innovation teams in organizations. He explained those conflicts with one argument — business and design teams achieve success from two polarized point-of-views. From the standpoint of a business, reliability is a paramount — the ability to repeatedly maximize gain while taking on minimal risk guarantees profit. From the point of view of design, validity is gold — it is through the evaluation of largest possible number of variables and insights from many sources, novel and new-to-the-world solutions can be created. Novel and new-to-the-world therefore, by nature, require taking business into territories that it does not want to venture. Roger suggests that design teams should take business teams’ point-of-view as part of the design challenge, be able to speak of the language of reliability, use analogies and stores (‘quasi-past data’) to help communications, and bite off as little as possible to generate proof (fail small and recover fast). Business teams, on the other hand, should take inattention to reliability as part of management challenge, be able to speak the language of validity, be open to share data and reasons (not only conclusion), and bite off as much as possible to allow innovation. After indulging the audience with his view on his daily work as the chief editor as the Wired magazine, Chris moved on to talk about his follow up book to ‘The Long Tail’, currently titled ‘Free’. Chris believes that along with the niche-based economy that he described in his last book, he also believes that companies needs stop generating products and services based on scarcity models (e.g. we can’t get this because X is too expensive). From processor speed, storage space, bandwidth and shelf space, what used to constraint development of new products has become, or can be expected to soon become, freely available. Companies that aspire to be successful in that new economy need to think beyond the limits that exist today, and sometimes artificially imposed upon themselves. User’s attention and reputation are the new currencies in the new economy. User’s will have direct influence in what is created, because when things are free, they are also disposable. Polished’ will no longer be the key, it will be ‘Relevance’. (e.g. New York Times vs. Blogs). Don’t predict (because it’s not possible), measure (by soliciting real-time feedback). Some of the presentation slides are posted here. Starting to blog again after a long pause.. many thought about design and organizational culture.